You are working in the Investment section of the strategic planning department of a major organisation. Your organization is considering the Australian equities market. 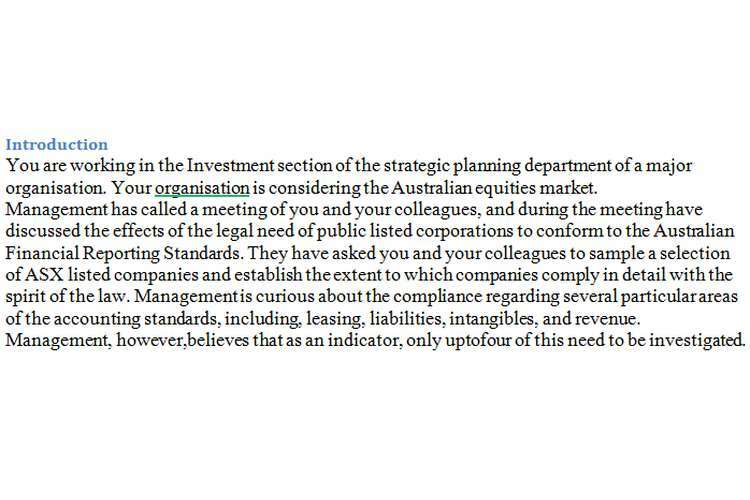 Management has called a meeting of you and your colleagues, and during the meeting have discussed the effects of the legal need of public listed corporations to conform to the Australian Financial Reporting Standards. They have asked you and your colleagues to sample a selection of ASX listed companies and establish the extent to which companies comply in detail with the spirit of the law. Management is curious about the compliance regarding several particular areas of the accounting standards, including, leasing, liabilities, intangibles, and revenue. Management, however,believes that as an indicator, only uptofour of this need to be investigated. Review the most recent financial statements of two Australian firms from different industries. Analyse, compare and discuss both companies’ disclosure of leasing to explore both firms’ compliances with relevant Australian Financial Reporting Standard and support your arguments using relevant research literature (You are not required to provide financial figures). Review the most recent financial statements of two Australian companies from different industries. Analyse, compare and discuss both firms’ disclosure of liabilities including provisions and contingent liabilities(excluding lease liabilities) to explore both firms’ compliances with relevant Australian Financial Reporting Standard and support your arguments using relevant research literature (You are not required to provide financial figures). Review the most recent financial statements of two Australian companies from different industries. Analyse, compare and discuss both firms’ disclosure of intangible assets to explore both firms’ compliances with relevant Australian Financial Reporting Standard and support your arguments using relevant research literature (You are not required to provide financial figures). Review the most recent financial statements of two Australian companies from different industries. Analyse, compare and discuss both firms’ disclosure of revenue to explore both firms’ compliances with relevant Australian Financial Reporting Standard and support your arguments using relevant research literature (You are not required to provide financial figures). At the end of each section, consider what improvements to firms’ disclosure may improve the decision usefulness and transparency of the accounting information you have analysed.Evidence of research beyond the prescribed texts is required. Ensure these are referenced appropriately in your references. You are however presenting ONE report covering the four (three) points, and therefore need tointegrate the four (three) points properly into the report at the introduction and conclusion.Therefore, you must justify why you chose the points you did and ignored other points. A short conclusion of your overall findings is expected by management.